As laboratories focus more time and more energy on quality improvement and error reduction, one thing seems clear to me; the phlebotomist does not have a chance. What appears on the surface as a simple task is one of the most complex in the whole of the laboratory process. A person has to greet the patient, check their identity (which includes catching the errors of the people before), check the list of tests, select the appropriate tubes, put them in the right order, check the arm for accessible veins, prepare the vacuum tube apparatus, put on the tourniquet, puncture the skin, draw the blood keeping in mind that too little is a problem, as is too much. Then they have to mix the tubes with additives, not too much and not too little, at the same time as changing tubes. Keeping the tourniquet on too long is a problem. When the needle comes out, make sure they don’t puncture themselves, or the patient, and the apply pressure to try and avoid a haematoma. Then check the requisition to make sure again that the right tubes were collected in the right order for the right tests. And then they have to get the labels right. All this is happening in the milieu of elderly people with small and weak veins, athletes with thick skin, children who are nervous and often crying and pulling away, and drug users who have shot their veins, and mom being distracted by the kids crying or running around. And then they have to go through it again, time after time, 40-50-60 times a day. And if a patient decides to complain because they felt rushed, or some discomfort, then we stack on more tension. And then we have the ICU and the Emergency Department situations with all their own inherant complications, distractions, and tensions. No wonder we have front end error as the greater proportion of significant laboratory error (40%) reported in most series around the world. James Reason would call most of the problems that occur in phlebotomy either as uncogntive slips, or maybe training issues. But I disagree. I don’t think that more training can help here. This is an interesting task that combines a highly complex series of steps that need to be done with mind numbing repetition and speed, in a distracting environment, with the constant reminder of zero tolerance for error. I think that the reality is that it is a near impossible expectation. There is a site called IVteam.com which had a very short article a year ago (September 9, 2009) that discussed the development of a phlebotomy performing robot under development at Department of Mechanical Engineering at Imperial College London. (http://www.ivteam.com/phlebotomy-robot). Now I know, as do you that machines are not ever perfect and there will be many arms that don’t work with the robot as well. But a robot is less likely to pick up the wrong tube, or get them in the wrong order, or under-mix or over-mix, or get the labels wrong. So for the laboratories that can afford it, we might one day see a mix of skilled phlebotomists and robots. For most places and most situations, we will continue to see phlebotomists sans machine. I think that Quality folks should be really up on this and follow along. Other than doubling or trebling the phlebotomy staff (like that is ever going to happen!) this is likely going to be the only way to really address pre-examination error. From the beginning of classification, there have always been lumpers and splitters. There are some who think that Quality Management, Risk Management, Financial Management, Safety Management, Personnel Management (Human Resources), are all the same, just Management. But I do try to find the interfaces. Laboratorians get Quality Management. We may not all do it, but we understand why it exists, and work towards it, each in our own fashion. What Qualitologists try to do is smooth that process out. And I think that laboratorians have a sense of Risk Management, although I think we see risk in three lumps: risk tolerance, risk avoidance and risk aversion. What we tend not to see is where and how managing risk fits into the the process of managing quality. There is a small, poorly known, ISO document entitled ISO/TS 22367:2008,Medical laboratories -- Reduction of error through risk management and continual improvement. The TS in the title means it is a "technical specification" rather than a standard. (Think of TS as "guideline"). But it is very helpful, because it links quality management and risk management together at the point of preventive action. The point is that avoiding risk is something that can and should be done before the bad thing happens. And using Risk Management tools like Failure Mode Effects Analysis can be useful. The most common situation in the medical laboratory where FMEA comes into play should be before you purchase the new equipment, before you make an overhaul of management structure, before you introduce that LEAN restructuring. Doing a swap out can be costly of TIME, EFFORT, ENERGY and MONEY, so before you expend it ask "if this goes wrong, why is it likely to happen, and what can I change now to prevent it". It is stunning how often we see changes that go in, and later after all sorts of problems have been discovered, it has to get pulled out. And I know that you have seen it too. Now we all know the Rumsfeld classification of known problems, known unknowns, and unknown unknowns, and the unknown unknowns will always bite you in the neck. But there are so many problems we can prevent by a little risk management FMEA before hand. 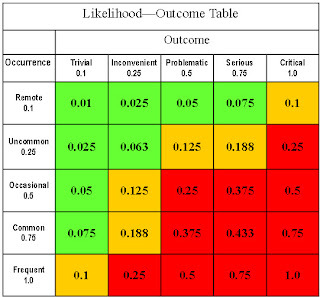 But there is another Risk Tool that I was introduced to a few years ago by an excellent Project Manager - the likelihood-outcome table. It is a valuable part of risk and equally part of priorities planning. By sitting back and looking objectively at a series of choices or problems to address, as yourself, "when these go south, what happens? How often do they occur and how bad is the outcome?" Those things that occur rarely but with a fatal outcome have to come before the event that occurs commonly but causes some maybe some annoyance or inconvenience. Below is a theoretical table, in which I structured likelihood of occurrence from remote to frequent and outcome from trivial to critical. We can put a value on those from experience, or literature, or estimation. In this table any L/O product greater than 0.2 has to have high priority. Any with an L/O less than 0.1 can have a pass. And those in between need to be addressed, but after the high priority ones are taken care of. From personal experience, it is a very helpful way of looking at projects and getting things done. There are a number of courses on the web addressing risk management. From what I have seen, they all cover similar concepts, but look at the one on www.westgard.com. As far as I can see, it is the only one that includes ISO/TS 22367:2008. Top 10 things you don't want to hear during an accreditation visit. We talk about 7 Quality Partners (Standards Development Organizations, Accreditation Bodies, Proficiency Testing Providers, Education Bodies, Professional Organizations, Hardware and Reagents Suppliers, and the Public). These are the groups that create the foundations and support for Laboratory Quality,. All of them play a valuable and for all intents and purposes, equal rolls. Except for the Public. When the public, either in the form of the media, or the regulators, or the legislators or the litigators get in the mood to fix quality, then everything else fades in comparison. In most laboratories, the proficiency testing provider is the one that you have the most frequent contact with. The accreditation body is the one that you probably have the least contact with, but generates the most stress. Many accreditation teams are comprised of well meaning volunteers, some of whom have had assessment training, and many of whom have not. With respect to my colleagues, just because a person has done many site visits (oh I do these all the time) doesn't necessarily mean that they have ever done one correctly. If, when your laboratory is undergoing an external assessment, you hear one of the following utterances, it probably is time to worry. 1: You should do it the way I do in my lab. 2: You don't do mass spec? We've been doing it for years. I thought every lab did mass spec. 3:: Oh I don't bother with the standard, I just look around and get the big picture. 4: Oh we're not here to be the police. We think of ourselves as educators first and friends second. 5: I understand, but we have decided that we are going to interpret that requirement differently. 6: Well if you thought that was picayune, I have another one for you. 7: Actually I have another commitment, so if you don't mind I'm can get this done in about an hour. 8: What do you mean you didn't get a copy of the new requirements. 9: Actually, I've never actually done microbiology, but our microbiology specialist couldn't make it. 10: Sorry but its our policy to not do a summary or exit report. We will be in touch soon. Others that you have experienced (or said yourself) are welcome. In a health care system where the government pays for health care, and neither the physician or patients has a financial stake, then where are the incentives for "zero tolerance for error" or "doing it right the first time". If neither the patient nor physician has any "skin in the game", then can laboratories really compete and differentiate for business by promoting "Quality is Job One"? And if the public sector hospital laboratory is absorbed into a global institutional budget are then any quality benefits, and if there are, where do they accrue? So expression like “Quality is the right thing to do” or “”Quality means better patient care” are not going to sway many arguments. 1: Losses from laboratory error represent substantial internal loss of time, effort, energy and money. On average laboratory quality errors cost an average of 135 minutes to address (range 30-1000 minutes). On a given day even a relatively error-free laboratory can count on losing the productivity equivalent of 1 person per shift. And that does not include the costs of sorting out cause and developing solutions. (I have purposely left physician and patient inconvenience out). (Yes, I am aware the list is showing my microbiology bias). In Canada these are problems that lead to inquiries. In the US they lead to litigation. In either event they represent significant money loss. 3: Accreditation. My personal bias is unfortunately that North American accreditation bodies tend to be pretty relaxed, and all sorts of problems slide through un-noticed, un-recorded, and ignored. But at some point even the weakest accreditation body will find and report on the bad thing, and can potentially create enough noise that licensure is threatened. At the sake of making non-friends, more accreditation bodies have got to start “stepping up to the plate” and being the monitoring agents they are expected to be. (Sorry for digressing here. More on Accreditation later). So, if Quality Managers want to have an impact, there are good and sound business justifications. And leave the “Quality is Job One stuff” to the folks who really compete. Don has tapped into the key and transformative next step, absent in so many laboratories. The following is supplemental comment is provided by Don. embraced the change have made considerable improvements in quality. concepts embedded within Lean thinking and 6 sigma. ideas rather than being suspicious or hostile towards them. More discussion on the Culture of Quality to follow. In the meantime, check out my presentation on Culture of Quality from the same meeting. Same topic, different approach, same message. Today was the second day and culmination of a very successful conference and workshop. I know there are many conferences to attend in all countries, including Canada (more on that shortly) but if you are interested in an eclectic conference on laboratory quality, consider looking at next year's Advanced Laboratories 2011 by marcus evans. Along with my own presentations (which in my opinion were brilliant!) there were a whole series of excellent presentations on training and competency, applying lean concepts to patient flow through patient care, and some interesting studies on coliform testing in the dairy industry. But for my money, the prize presentation was by Don Mikkelsen of the New Zealand Blood Service, on "Transforming your management culture to ensure quality and safety improvement". Using references as broad as Fredrick Winslow Taylor (1911) and James Reason (Human Error) and David Marx (Just Culture) and Groucho Marx ("I have principles, but if you don't like them I also have other principles" Mikkelsn painted a picture of a laboratory environment that recognizes error, but reacts reasonably and appropriately. Council for human errors (slips and distractions), caution for risk behavior, and discipline for Reckless behavior. Over-reaction with minor events does know one any good, nor does under reaction for reckless behavior. Its a matter of knowing what is happening and how to react and when. Quality and Safety thinking lead to the same end. Organisational culture is the single biggest factor in progressing either. A just culture will open the door to a quality improvement culture. And be flexible about what quality tools and principles you adopt. Don Mikkelsen and I see a lot in common about accreditation, KPIs, and a series of other things about Quality. I will see if I can get permission to post his presentation and get a written comment. I am participating the Advanced Laboratories 2010 conference in Melbourne. It is going extremely well, but it reminds me of a sign that I saw in a gospel mission down the street from the hotel and conference centre. "Welcome to the Tower of Babel. Many languages spoken here". My reference to the sign has NOTHING to do with religion or the Bible, and NOTHING to do with trying to understand the Australian accent with my Canadian ears. But it has a lot to do with diversity. This meeting is all about laboratory quality, but not just medical laboratory quality. Participants here include people from medical laboratories or medical related laboratory (about 25%) but more (maybe 50%) form dairy, food, and water laboratories. The remainder come from a diverse group of soil analysts, a police forensic services laboratory, big pharma, the petroleum industry, a few veterinary laboratories, and cement and minerals laboratories, one even one from a laboratory of military equipment. Pretty diverse, but all with a common interest of laboratory quality. What is interesting is how each of us creates our own jargon and definitions of terms. Most of the laboratories monitor KPIs (Key Productivity Indicators), a term very uncommon in medical laboratories (Think of broad based quality indicators as something close). And what I get from the term "case presentation" is totally different from most of the others. And then there is "verification" and "validation" used opposite to what medical laboratories use, and another thing called "measurement systems analysis" (?). And even the simple word like competency has a wide variety of meanings and interpretations. But at its core, Quality does prevail and there is more in common than in difference. Everybody seems interested and focused on error reduction and error prevention. Everybody is interested in continual improvement. And lots of focus on Leadership. And even interest in proficiency testing. I had some doubts about how this was going to work out. Happily it looks like it will be a big success. Another big day tomorrow. When we are finished I will post some of the presentations and get some writings from this interesting group of qualitologists. I did a "Pub Med" search (see http://www.ncbi.nlm.nih.gov/pubmed) today to see what I could find about recent publication of articles of interest to the laboratory qualitologist. Using a search of (Medical Laboratory OR Clinical Laboratory) AND (Quality Management) AND (English language) AND 2010-to-date, I came up with 140 articles. A few observations. The variety of articles present was broad and involved accreditation, proficiency, utilization, medical information systems, ECG reading interpretations, quality cost, and quality control articles, plus, plus plus. So there is a RICH load of Quality literature. A quick glimpse of the journals in which the manuscripts were found was equally rich and varied. There were 4 articles in one journal, but otherwise on a quick examination I didn't find any other duplications. So it is fair to say that many of us are interested in publishing, and there are lots of journals that are interested in receiving and publishing our manuscripts. But let me temper this with some of the darker side. My access to Pub Med gives me University free access to full articles, but even with this I could get access to only about 40 percent of the manuscripts. Access to many manuscripts cost $40 dollars or more. Having access to an abstract only is rarely of value. So while there is lots available, we still have challenges in getting access to all this valuable information. I don't have a solution, at least not one that would satisfy many copyright lawyers, but one possible solution would be for blog folks or web-sites to provide access to people that want to precis manuscripts that they find interesting and valuable, giving all the appropriate credit where credit is due. It is a new world we live in and many of the old rules for communication are being challenged. This is a good thing.